Managing a tax and wealth management business isn’t easy. But it can be. And it is the fastest and least expensive way to grow a wealth management business. It just takes focus and time to perfect your ability to manage it wisely. 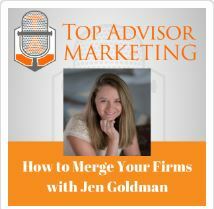 Below is the TopAdvisorMarketing podcast of me and Matt Halloran discussing how to blend the two business lines successfully. Also, I provide an audio recap of my written list of tips below. These ideas have worked with several tax and wealth businesses and can be used by you as you navigate the “blend” of tax and wealth. Remember that you are not alone in trying to manage a tax and wealth business successfully. Per Kitces and AICPA, 38% of people view CPAs with a high or very high degree of ethics and trust. And of the 54% of CPAs that offer retirement planning services, approximately half do succession planning and a quarter offer wealth management services. It is worth blending the two business lines as you are creating one of the most successful wealth management business models possible. PODCAST WITH TOP ADVISOR – Click HERE. BUSINESS: Document your goals on gross revenue, profitability, and number of client relationships you want each advisor to manage. SALES: Decide if you will work with a client that WON’T engage you for wealth management. Ask yourself – is the tax work sufficient for you and your team? Is it mentally and monetarily rewarding? Do you want your business to be project or ongoing relationship-based? Your decision determines all the decisions you must make below. COMPLIANCE: Confirm your compliance firm is an expert in tax and wealth regulations at the federal and state level. Ask for a checklist of items your firm needs to complete annually and bake those into your CRM. MARKETING: Blend the two brands and services into one website, one URL, one @email address. This helps the prospective client and your staff more quickly find and understand the blended business and services. Then create a marketing plan for each of the two services and find ways to eliminate duplicate efforts with social media, blog, website updates, newsletter, client event, and more. STAFFING: Document roles and responsibilities to ensure no one is overworked, there are career paths for those that care, and everyone has time to continually refresh their knowledge while learning new concepts. PRIORITIZING: Document major projects on a calendar to ensure they are not overlapping and crushing the staff. Practice the lessons of Essentialism. CALENDARING: Confirm you aren’t diluting your value with overloading your clients on all topics within one client meeting a year. Too often tax wealth firms schedule client review meetings during Feb-April. The clients are focused on tax and you are asking them to focus on wealth management ideas at the same time. It is too much for them and frankly, too much work for your staff to schedule, prepare, and annotate every note and task to recap the meeting and next steps. TECHNOLOGY: Just have one of each type of software (CRM, Document, Tax, Client Portal, Video/Screen sharing, Appointment Scheduler) and integrate them to reduce data entry and confusion. Above all, KISS keep it simple silly and then give yourself a hug for each epiphany you have along this journey of being the best owner you can be! Good luck as you continue to improve your business! PS. Want to talk more about how I help businesses transform? Click HERE. Want to receive my monthly solutions email? Click HERE.